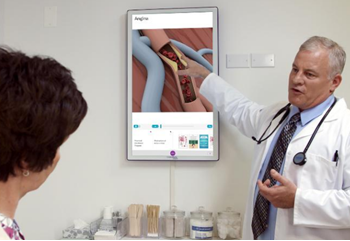 Doctor office advertising and patient education technology company Outcome Health raises $500 million in funding, valuing the Chicago-based company at $5 billion. Forbes estimates that the 31-year-old co-founder Rishi Shah owns 80 percent of the company’s shares, giving him a paper net worth of $3.6 billion. Forbes also estimates that the company’s annual revenue is $200 million and it’s growing 100 percent per year, with most of the money coming from drug companies anxious to get their message in front of patients at an opportune time. Vivek Kundra, the first US CIO, is a company EVP. Tuesday’s HIStalk page views exceeded 10,000, which isn’t a record or even all that much higher than the usual daily traffic, but it’s the highest count during a non-HIMSS week other than June 28, 2016 (when McKesson announced that it would divest its Technology Solutions business) and July 30, 2015 (when the DoD awarded Leidos/Cerner its EHR contract). This week on HIStalk Practice: Allergy Partners opts for Medfusion technology. Rhode Island practices unite as Brown Physicians Inc. Outcome Health raises $500 million in a quest to assist 70 percent of practices. Practice Fusion’s Matthew Douglass argues that America’s doctors need net neutrality. HealthTap expands to New Zealand, while Heal heads to Washington, DC. EVisit raises $2 million. US HealthWorks taps AmericanWell to power its new telemedicine service for employers. I had these reactions when writing about the company’s settlement. I was curious about how many EPs have attested to Meaningful Use using EClinicalWorks. ONC’s Health IT Dashboard shows around 25,000, making it the #3 EHR vendor (behind Epic and Allscripts). The settlement amount represents 35 percent of the company’s annual revenue of $440 million. The settlement could be only the beginning of ECW’s problems, as it now has to deal with potential customer defections, the inevitable drop-off in sales, and potential class action provider lawsuits. It could possibly be sued by its certifying body, Drummond Group, plus it is required by the settlement terms to implement internal and external review programs. Does Drummond Group, which certified ECW’s EHR, bear any responsibility (legal or otherwise) for failing to detect that ECW was – according to the complaint – rigging its test results? On the other hand, it could argued that since the certification testing scenarios are public and static, the certification body has no easy way to detect fraud in observing only the desired scenario outputs. Certification testing is not dynamic nor comprehensive – it’s following a script to see if the expected outputs are produced. The $30 million whistleblower payment will surely encourage others to report any similar problems with other vendors. Clearly DOJ was not happy that ECW apparently charged customers for software updates, made it hard and/or expensive for them to migrate from ECW to other EHRs, and did not make it easy for its customers to exchange information with other practices. The kickback portion of the complaint arose from ECW giving users a $500 maintenance credit to refer a prospect who eventually signed on as a customer (those payments totaled $144,000), paying users to host site visits ($249,000), compensating customers to provide good product references, and providing consulting fees, honoraria, and gifts to influential users who pitched its product, with one unnamed doctor earning “tens of thousands of dollars in ‘consulting’ fees.” The complaint makes it clear that manufacturers can’t pay any kind of remuneration to encourage use of their products for which the federal government pays via Medicare and Medicaid. It’s not clear how the settlement affects ECW-using EPs who could continue attesting under the Medicaid part of Meaningful Use for several more years. Apparently not at all since the product’s certification remains intact. Two ECW technical employees will pay relatively small settlement amounts over the product’s inability to process RxNorm terminology for e-prescribing. 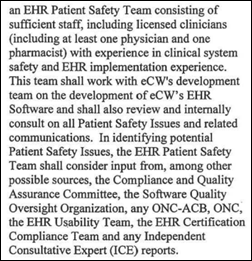 One of those employees was the developer in charge of the RxNorm software functionality and the other submitted ECW’s final certification application. The complaint says the certification body certified the product in 2013, heard afterward from ECW employees that the software didn’t really process RxNorm codes, and then re-tested the product with the same protocol in 2015, which ECW passed only because it hard-coded the expected 16 RxNorm codes. The complaint says ECW’s EHR did not use LOINC or SNOMED CT terminology. The complaint says ECW released software without adequate testing, relied on customers to report problems, allowed critical problems to remain unresolved for months or years, and reintroduced previously fixed bugs because its software version control was not reliable. The company’s October 6-9 user group meeting should be interesting. The whistleblower in the case was Brendan Delaney, who was a New York City employee implementing ECW at Rikers Island for prisoner healthcare when he noticed software problems. He has also worked on ECW projects for Arcadia Solutions, HSM Consulting, and as a self-employed contractor. His LinkedIn says he’s revenue cycle manager at NYU Langone Medical Center, or at least was before he learned he’ll be pocketing $30 million (but unfortunately for him, whistleblower windfalls are taxed as ordinary income). ECW is required to implement a quality assurance program to oversee software defects, usability problems, and any other issues that affect patient safety or product certification and to post known software problems on its portal. The company is required to create usability and patient safety advisory teams, consisting of at least a doctor, pharmacist, and nurse. ECW is prohibited from using contract language that prohibits customers from disclosing patient safety concerns and agrees that it won’t enforce that requirement in existing contracts. The company must help customers who want to migrate to other EHRs and can’t charge them any fees, penalties, or service charges. ECW is required to contact every customer with an email subject line of “Important information about your EHR software and services. You have new options free of charge to you.” The communication must start with a statement indicating that ECW has settled with HHS OIG to offer them free upgrades to the latest production version. The company must track any payments made to existing customers for marketing purposes and must list all of payments it makes to providers on its website. Review the certification process to make sure nothing is being faked, talking to the technical people rather than managers anxious to avoid becoming the shot messenger. Don’t provide any kind of incentives for customers or their employees to help make new sales. Make sure customers are notified quickly of software problems that endanger patients or that can cause billing mistakes or certification shortcomings. The firm filed Brandon Delaney’s lawsuit against ECW in 2015. The firm’s website includes archived copies of advisories ECW sent to its customers that warned of software problems. Yesterday we announced a settlement with the government. As part of the settlement, eClinicalWorks paid $155 million and agreed to bolster its compliance program. The inquiry leading to the settlement primarily centered on technical aspects of the Meaningful Use program and allegations that eClinicalWorks software had technical non-conformities related to some of the criteria, all of which have since been addressed. eClinicalWorks cooperated fully with the government. We have not admitted any fault or wrongdoing, and our goal as a company is to always make sure we are doing the right thing. We have decided to put this matter behind us and concentrate all of our efforts on our customers and continued innovations to enhance patient care delivery. Importantly, our software remains fully certified under the Meaningful Use program. One of the technical non-conformities alleged by the government involved the use of RxNorm codes in electronic prescriptions. From 2014 to August 2016, electronic prescriptions sent by eClinicalWorks users included NDC codes rather than RxNorm codes. During this time period, more than 500 million prescriptions were successfully transmitted and filled, and most major pharmacies did not support RxNorm codes. 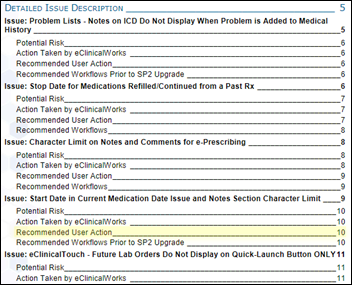 The failure to include RxNorm codes in electronic prescriptions was completely inadvertent on the part of eClinicalWorks, as our software used RxNorm codes in other parts of the system, such as in C-CDAs. We gained nothing by not including the codes, which are available for free from the National Library of Medicine. We resolved this issue as soon as we learned of it. Another technical non-conformity identified by the government involved data portability. The 2014 Edition certification criteria require EHR software to “batch export” patient records. There was confusion about the meaning of this requirement, however, prompting ONC in 2015 to issue a clarifying FAQ. When eClinicalWorks was tested for certification in 2013, its authorized certification body (ACB) at the time, CCHIT, determined that our software satisfied this requirement. In 2015, our new ACB, Drummond Group, disagreed and identified this as a non-conformity. eClinicalWorks resolved the non-conformity in 2015, and our software meets all MU Stage 2 data portability requirements. Historically, technical non-conformities with the MU Program were addressed through an administrative rather than a legal process (visit the ONC’s Certified Health IT Product List (CHPL) website for a list of EHR vendors with non-conformities: https://chpl.healthit.gov/#/search). eClinicalWorks chose to settle this matter to avoid the uncertainty of a prolonged legal dispute which could have been disruptive to our customers, our employees and our company. The government also alleged that eClinicalWorks’ customer referral program violated the federal Anti-Kickback statute. Under this program, called “Refer a Friend.”eClinicalWorks granted a credit, typically in the amount of $500, against existing users’ support and maintenance fees. Between 2011 and 2016, eClinicalWorks paid $392,000 to users under this and related programs. While referral programs like this are common in the industry, and while HHS-OIG has provided no guidance regarding them, the government took the position that the payments were improper. We disagreed but have nevertheless discontinued the program. There is a silver lining to this settlement. Today, eClinicalWorks has a more robust compliance program, and we continue to invest our resources and energy into making sure the products and services we deliver serve our customers well in the long run. We paid the settlement amount using cash on hand and have the resources to continue to grow and innovate. It is our privilege to serve you. I am committed to enhancing our products and services. We will be releasing V11 later this year as planned and seeking certification for Meaningful Use Stage 3. We founded this company 17 years ago with the mission of improving healthcare together. The settlement does not change that. 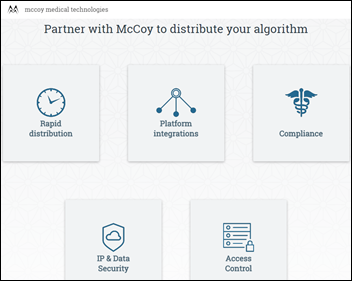 Medical image viewing system vendor TeraRecon acquires machine learning vendor McCoy Medical Technologies and creates a new company that will distribute trained machine learning algorithms for clinical decision support, also offering researchers and hospitals an easy way to distribute their algorithms for research or commercialization. 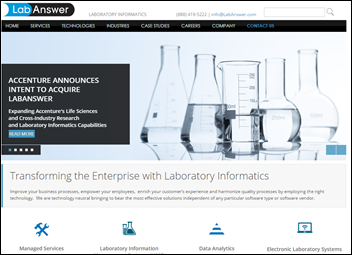 Accenture will acquire 250-employee laboratory informatics consulting firm LabAnswer, which it will fold into the newly created Accenture Scientific Informatics Services. Carilion Clinic (VA) chooses Influence Health’s directory listings management system to monitor its online presence, provide accurate online location listings, and call out unofficial social media pages. 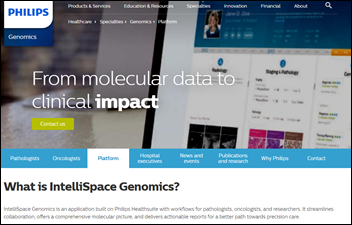 Memorial Sloan Kettering Cancer Center (NY) and Intermountain Healthcare (UT) will use the genomics platform of Philips for cancer research and treatment. Children’s of Alabama (AL) hires Bob Sarnecki (ClearData) as interim CIO. In England, Beverly Bryant (NHS Digital) will join System C as COO. SurveyVitals, which offers digital patient experience surveys, hires Robert Harrington, Jr., MD (Reliant Post-Acute Care Solutions) as chief medical officer. Rob Bart, MD (LA County Department of Health Services) joins UPMC as CMIO. An Ellis and Adams research report reviewing the impact of hospital acquisitions on quality finds that the average quality score of an acquired hospital slipped 5 percentage points in the first year. DrFirst launches new solutions for Meditech users – SmartSig to manage free text prescription instructions and integration with prescription drug monitoring program databases. The medical records (including photos) of 15,000 patients of a Los Angeles plastic surgery clinic – some of them celebrities – have been stolen by a fired employee. In India, the Mumbai health department’s online birth and death registry is taken offline following complaints that its lack of security was allowing anyone to look up random names and print their birth or death certificates. A government official complains that only the medical health officer is now allowed to use the system and “he cannot keep printing certificates for everyone” in keeping up with the city’s daily workload of 400 births and 200 deaths. Australia’s health department decides that the records of people who opt out of its My Health Record system won’t be deleted, but rather hidden from providers, allowing those who opt out to change their minds later. 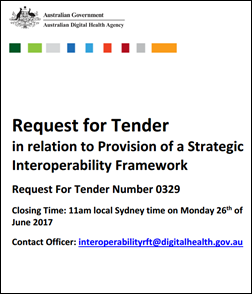 Australia’s Digital Health Agency issues a request for tender for developing a plan to connect all health-related systems over 5-10 years. 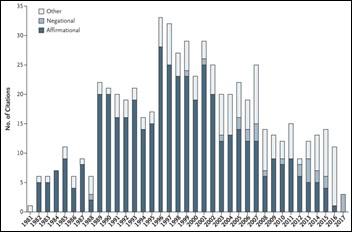 A five-sentence letter published in NEJM in 1980 concluding – without much evidence – that opiates aren’t addicting when prescribed for chronic pain has been cited more than 600 times since, with references to the article spiking after OxyContin was brought to market in 1995. The authors note that most of the citations misinterpreted the information or mischaracterized the letter’s conclusions in encouraging doctors to use long-term opiate therapy that contributed heavily to today’s national addiction, leading to their recommendation that authors cite previous studies carefully. Facebook is hosting an invitation-only meeting next week to court drug companies as advertisers. EClinicalWorks will exhibit at the California Primary Care Association Region IX Clinical Excellence Conference June 4-6 in Lahaina, HI. FormFast and Imprivata will exhibit at EHealth Canada June 4-7 in Toronto. Aprima wins Frost & Sullivan’s product leadership award for its RCM platform. The Atlanta Business Chronicle profiles CFO of the Year finalist and Ingenious Med Chief Compliance Officer and CFO David Lamm. InterSystems’ TrakCare tops global EHR deployments, according to a new KLAS report. I would not paint all vendors with the ECW brush. I worked with over 40 vendors (big and very small) guiding them thru the Cert process and not one of them did what ECW did. As crazy as it may have been they wrote (or purchased) real code to do what was needed..even though they may have hated the process! I concur with FLPoggio’s comment. I too have worked as an implementation consultant with many EHR (and general HIT) vendors, and in particular with eCW many many times. In my experience eCW is unique in their crass commercialism and their indifference to, and lack of interest in, the health care mission. The current owners/leadership are incredibly cynical and don’t believe that they can learn anything from anyone else (especially customers), and in general they view their customers as perpetual whiners who should stop complaining and be happy that they are receving a functional product at a low cost. That is why eCW has been losing share with larger customers who: don’t like to be ignored, have zero tolerance for immature software and management practices, and genuinely want to improve health care delivery. The only hope for the company at this point is for the current owners/leaders to recede into the background in favor of professional and motivated leadership brought in from the outside who can convince the eCW customer base and employees that they can change company values and attitudes from top-to-bottom, and translate that into professionally designed and delivered software services that provide clinical value and user joy. This should be the time for deep introspection and soul-searching, but unfortunately for eCW’s employees and customers, history does not suggest that eCW leadership is willing or able to lead such a turnaround. 3. MU requirements are irrelevant because they are not used by pharmacy! Get real ECW, my practice will certainty be taking advantage of your free services to migrate to a competitor. Wonder what the ECW and MU issue means for those ECW users rolling up on CEHRT 2015 requirements for MACRA. How can a customer read the ECW letter and believe any of it? The statements themselves make zero sense. For example, resolving the RXNORM issue as soon as they learned of it? Logic says that means they would have supported RXNORM for ePrescribing as soon as they read the requirement; not faking their certification of it. If I’m a customer, I can’t believe anything else in this letter. Frank and Charlie – That other EHR vendors aren’t doing this is fine but the broader issue is that there are really no safeguards – public or private – from others in this industry literally doing the same thing for years. ECW has even been a member of the HIMSS EHRA (http://himssehra.org/ASP/case_studies.asp). Time and time again this is an industry that has both failed to police itself with regard to safety and unintended consequences while actively and vociferously resisting oversight. It’s stuff like this that will force the FDA to regulate this industry. eCW and athena have not been member of EHRA for a while. They don’t believe in dealing with all the Gvt. garbage. Won’t be surprised when the yellow tape goes up around athena’s headquarters. My point is that this industry is going to be forced into “dealing with all the Gvt. garbage” – and not the billions of incentive dollars kind – if they don’t start policing themselves, including the bad actors like eCW. Would be interesting to know to whom liability would accrue if it is discovered that patients were harmed through eCW’s fraud and whether eCW will be sued by providers who seek to change to another product. I concur with FLPoggio’s comment – too!